The first Winnipeg Amateur Radio Club was apparently formed in 1919 but it's history has been lost in the mists of time. The following historic milestones and events have been gleaned from scraps of minutes and other sources collated by Ed Henderson VE4YU. The Amateur Radio League of Manitoba (ARLM) constitution was created. 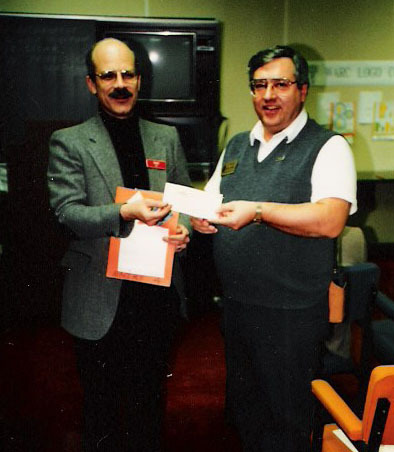 Mike Pura VE4MP was Honorary President and Stuart Richard Talbot was President. Five radio enthusiasts formed the club Amateur Radio Bugs of Winnipeg. None of the founding members were licensed at the time. In November of 1955, Ronald B. Adamson became the club's first license holder as VE4TA. The second licensed member was Ralph, who became VE4SX in December. Meetings were held at Ronald Adamson's home at 467 Burnell St. and by January, 1956 there were 10 members. In January of 1958 the active membership was over 25 and the club was meeting in the Free Press building. In June, 1958 the club held it's first ARRL Field Day. 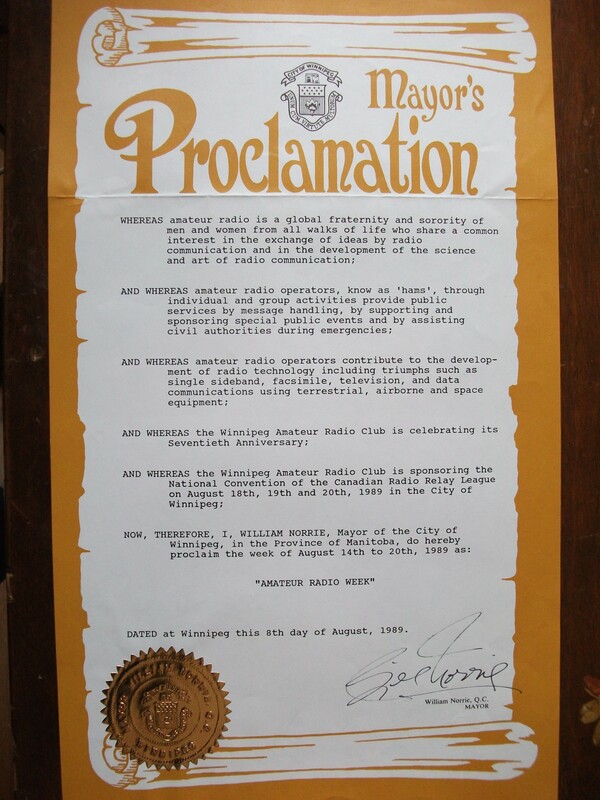 Circa 1958/59 the club became the "Winnipeg Amateur Radio Association"
The Manitoba Association of Radio Clubs (MAARC) was formed and it's first meeting was held on January 26, 1967. Mike Pura VE4MP was the chairman. The present day Winnipeg Amateur Radio Club (W.A.R.C.) was formed by the amalgamation of the Amateur Radio League of Manitoba, the Winnipeg Amateur Radio Association, and the Bison Amateur Radio Club. Since it's inception, the W.A.R.C. has been a strong presence in the Winnipeg amateur radio community and currently has approximately 280 members. After seeing the web site listing of the former executive members of WARC, I thought I would attempt to update the information. There may have been some switching around since I recall that Blake Dunn, VE4AFF also held a role. Perhaps, YU still has some files from then. 1. Resurrecting the Club from near oblivion. Active participation had dropped so much that only a dozen or so hams came to meetings where people argued about the Minutes of the prior meeting! By instituting a method whereby decisions were taken in Executive Session before the meeting and ratified if necessary at AGM, the monthly meeting of members could focus on education, information, entertainment, and fellowship. This meant that we had to develop a slate of speakers for almost every meeting. 2. We competed for and won the hosting rights for the last Canadian Radio Relay League Convention ever held. CRRL later became part of the Canadian Amateur Radio Federation (CARF) the precursor to the Radio Amateurs of Canada (RAC). The Convention was held 1989 August 18, 19, and 20 at an hotel near the airport (it still is there but has been renamed at least twice). Mayor Bill Norrie and I knew each other from other civic projects. I asked him if the City would recognize the upcoming CRRL convention event. He declared the week of August 14 to 20 as "Amateur Radio Week". By that time, our Executive slate had been replaced twice and the President during the convention was Dave Kovnats, VE4DBK, so I only was a bystander. My favorite memory of the Convention was the midnight induction into the Royal Order of the Wouff Hong. For the Club files and perhaps the web site, I provide the above information and the associated images. This is a shot of unrecalled MTS executive who spoke at one of the 1985 meetings about the then new cellular telephone service. 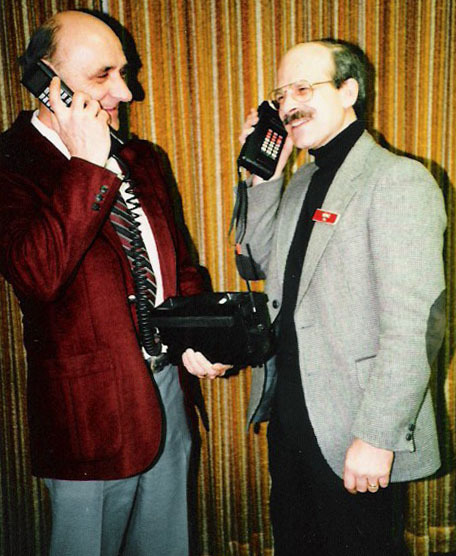 Notice the size of that phone. This is a shot of me, VE4KZ, congratulating John Gowron, VE4ADS, upon being selected as the winner of the WARC logo development contest. The photo is dated 1985 but it might be early 1987. 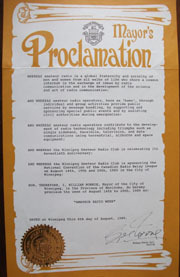 This is a shot of the municipal Proclamation mentioned in item 2, above. It is possible that photos exist of the actual signing but I do not have them.